Charisma Archives » Tekee Media Inc.
My ensemble Charisma presents an intimate concert heralding the spring! 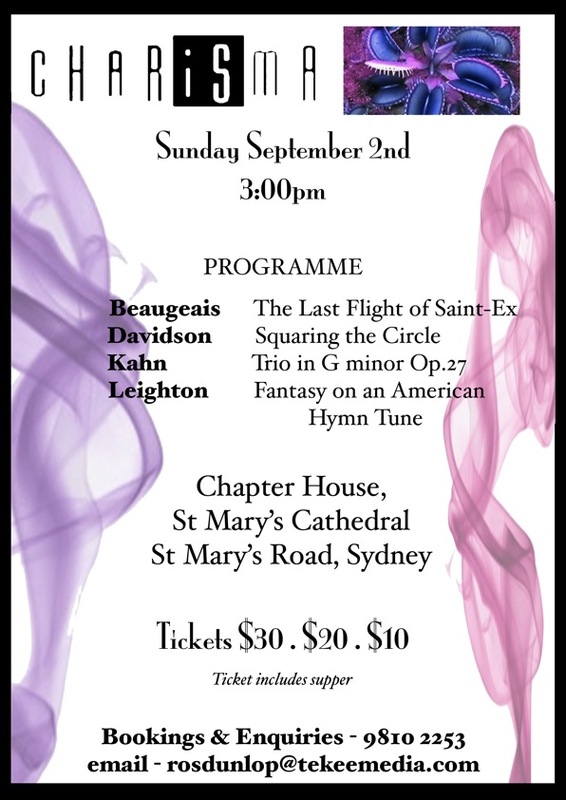 Featuring music by Australian composer Katia Beaugeais – The Last Flight of Saint-Ex (based on the last flight of the french writer Antoine de Saint-Exupéry shot down in the second world war in 1944), and Australian composer Robert Davidson – Squaring the Circle for clarinet trio. The Fantasy Trio based on an American Hymn Tune (Shall we gather at the river) by composer Kenneth Leighton and the beautiful late romantic trio for clarinet, cello and piano by Robert Kahn. Join the musicians at the conclusion of the concert for afternoon tea and drinks and convivial company which is all part of the ticket price. Tickets $30, $20, $10. Venue is the beautiful historic Chapter House part of the St Mary’s Cathedral complex, which creates an intimate setting. There is easy access to parking nearby at the Domain and Cook & Phillip pool carpark and public transport via trains to St James Station and buses to College and Elizabeth Sts. We would love to see you there! Guest artist Valmai coggins – viola. Complimentary drinks at the conclusion of the concert and nibbles. Tickets $30 adults, $20 concesson, $10 students, children with a paying adult are free. 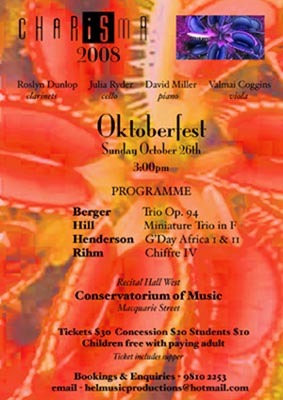 Included in our concert to celebrate Oktoberfest are a combination of works by German Composers and Australian composers. Two of the G’day Africa chamber works by Moya Henderson for clarinet,/bass clarinet, viola, cello and piano, the first G’day Africa has influences of several African styles of rhythm and music, the second G’day Africa is a lyrical peaceful work dedicated to Kevin Volans. The Minature trio by Alfred Hill originally written for violin, cello and piano, with a part Alfred Hill later wrote for Clarinet in lieu of the violin part, in a new addition by Stiles Publications, the sole publisher of Alfred Hill’s music. Chiffre IV by Wolfgang Rihm for bass clarinet, cello and piano is a sparsely textured work written in 1983. Wilhelm Berger Trio for clarinet, cello and piano is from earlier times in contrast to the rest of the programme. Charisma is an ensemble which continues to explore the repertoire for clarinet, cello and piano, and has a reputation for presenting concerts which display an eclectic variety of styles and repertoire. Australian Composers are featured in each program and they have commissioned and premiered many pieces in their years of concert giving. We hope you can come and join us for a glass of champagne or wine ….or a german beer to celebrate the end of our 2008 season! Charisma would like to invite you to our third concert in our 2008 series. 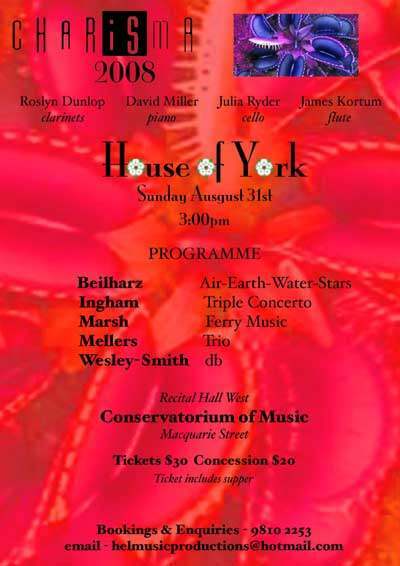 The House of York, referring to the University of York where a number of the Australian composers represented in this concert spent time as post graduate students. Wilfred Mellors, probably best known as an eminent musicologist was teacher to Roger March, Stephen Ingham and Martin Wesley-Smith, Kirsty Beilharz was a post graduate at York a couple of decades later. The program promises to be diverse and James Kortum plays with Charisma in Wesley-Smith’s piece db the title referring to the Australian Composer Don Banks. Join us at the conclusion of the concert for a drink and nibbles.